When Carol in Accounting exclaimed that the porcelain doll in the red dress chomped down on one of her fingers, we all figured she fell asleep at her desk and had a bad dream. * (Hey, it happens!) But since then, there's a general consensus that Carol wasn't dreaming. Different office supplies have gone missing only to be found in the doll's clutches days later. There was one occasion when she flung herself from one of the warehouse rafters and pulled an intern's hair! We wouldn't have believed it if we didn't see it with our very own eyes. Since then, we've learned to appease the possessed baby by leaving a milk-filled bottle and tiny trinkets next to her every evening before we leave for the day. You know what they say, happy bewitched doll, happy work environment... right? The haunted doll measures approximately 14-inches long and has a stuffed body so feel free to give her a hug if you're feeling brave enough. The plastic is meticulously painted to look like cracked porcelain and when 3 AAA batteries are inserted into her back, her eyes light up red and she makes spooky sounds. 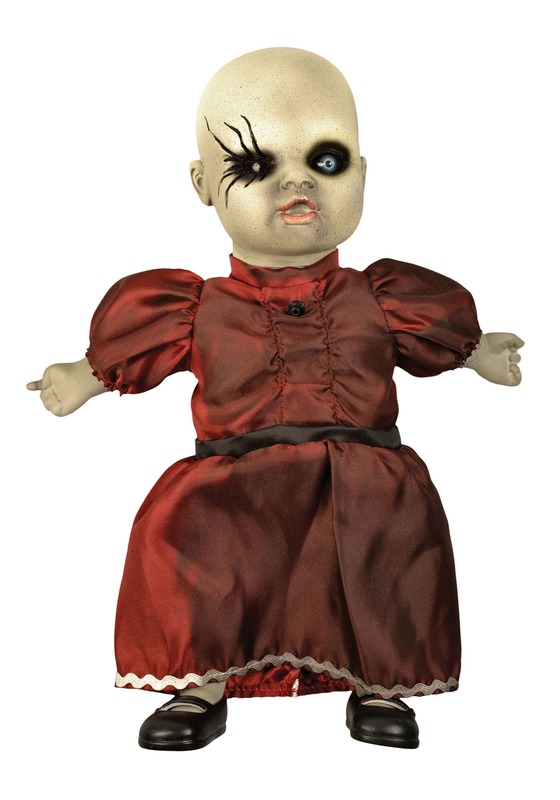 Pacify the possessed plaything by placing her in an old wooden rocking chair or a vintage bassinet. Occasionally leaving her treats and toys isn't a bad idea either. And if she happens to bite you? Don't sweat it because her teeth haven't come in yet.